Kinder Schoko-Bons Crispy: the unique treat. 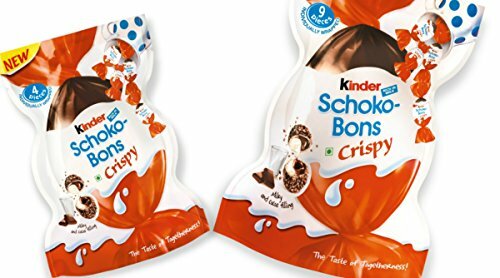 Kinder Schoko-Bons Crispy is a bite sized, oval shaped treat. It has delicious milky and cocoa filling inside a crunchy milk chocolate coated wafer biscuit covered with tasty cocoa sprinkles.The treat splatters in the mouth to give an amazing taste experience. Kinder Schoko-Bons Crispy is a unique treat that appeals to the entire family. The different pack sizes make it ideal to share it with loved ones and create moments of togetherness. Kinder Schoko-Bons Crispy is Proprietary food - crisp and milk chocolate coated wafer biscuit with a milky and cocoa filling Ingredients: sugar, edible vegetable oils, milk chocolate (18%), (sugar, cocoa butter, milk powder, cocoa mass, emulsifier: lecithin (soy) - INS 322), skimmed milk powder, wheat flour, low fat cocoa powder, wheat starch, whey proteins, emulsifier (lecithin (soy) - INS 322), raising agents (INS 503ii, 500ii), powdered malt extract, salt. Total milk constituents: 16.5%; Total cocoa solids 10%. Kinder Schoko-Bons Crispy is a unique treat that appeals to the entire family. ***Product Ships From India. You will receive a total of 45 Schoko-Bons Crispy. Schoko Bons Crispy may come in different size packaging depending on availability. If you have any questions about this product by Kinder, contact us by completing and submitting the form below. If you are looking for a specif part number, please include it with your message.